The long-lost Maya ruins of Tipan Chen Uitz in Belize are only beginning to give up their secrets, with the latest discovery being something of a home run: Archaeologists found two table-size stone panels, depicting elite ballplayers, that likely would have greeted subjects walking by the palace, according to a new study. 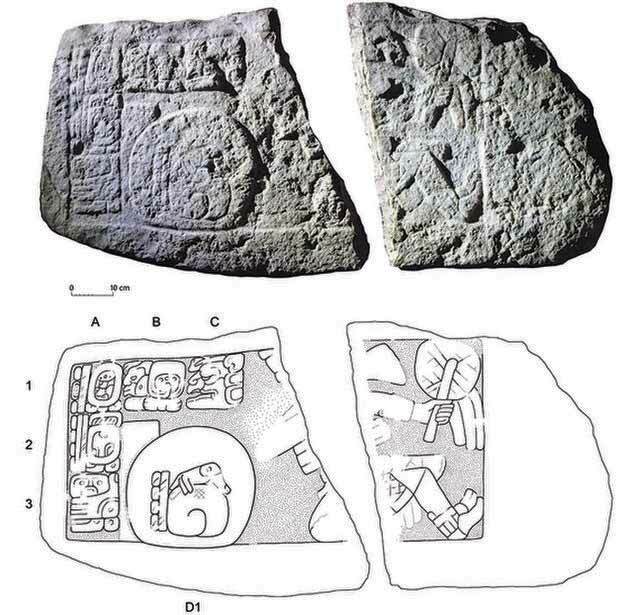 The discovery of these two panels reinforces the idea that the Maya people would have placed a lot of importance on the ballgame, and suggests that it helped the Maya connect with different communities in their vast network, the researchers said. Discovered in 2015, the two ballplayer panels are the first of their kind to be found in Belize, the researchers said. Both have carvings depicting ballplayers and hieroglyphic captions, and they are thought to date to between about A.D. 600 and A.D. 800, Andres said. One monument (dubbed Monument 3) was found cracked in two and lying facedown. It would have measured about 4.7 feet long, 2.1 feet tall and 0.6 feet wide (1.4 by 0.7 by 0.2 meters). It had only "minor damage and moderate weathering," allowing the archaeologists a good view of its carving — a large ball next to a ballplayer who is wearing a protective belt and holding a staff-like object with streamers (possibly a fan), the researchers said. "The panel may depict a ballgame that was celebrated within the ballcourt at Tipan Chen Uitz, or commemorates such a game played at an allied site," the researchers wrote in the study. do the guys on the beach in San Pedro still sell mahogany carvings of the Maya scuba god?